Come learn the fundamentals of tasting wine, based on the 7 S’s: See, Smell, Swirl, Smell, Sip, Swish, Savor. We guarantee you’ll leave this class understanding the basic characteristics of the most common and popular grape varietals, including chardonnay, sauvignon blanc, cabernet sauvignon and pinot noir—as well as some classic cheese pairings with each. Tonight Leif and I took advantage of a Christmas gift I gave him! We bundled up and made our way to the Marion Street Cheese Market to take the Wine Tasting 101 class mentioned above. We had a delightful time, learned a great deal, and enjoyed a few surprises along the way! First and foremost the setting at the cheese market is simply fantastic and the community feel of the establishment was enhanced by the communal tables set up for the class. Our teacher, Connie, was well versed on the subject and maintained a necessary(but all too often forgotten) approachability when it comes to wine tasting. We swirled, sipped, and swished six wines from various regions over a range of price points. No surprise one of my favorites was the most expensive, but interestingly enough it was a white (2007 Domaine Vacherone Sancere from Loire Valley, France $35/bottle). The 2007 Cypress Cabernet Sauvignon finished our tasting as the highlight and surprised me greatly by having a $10/bottle price point! 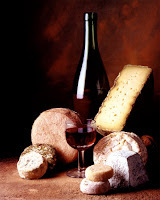 Oh and anytime you get to learn a little about wine and nosh on a gorgeous Manchego it is bound to be a good time! I highly recommend checking out a class; they have many to offer at the market...check them out and go!